Actor-host Ethan Salvador admits that this is his most serious relationship to date. 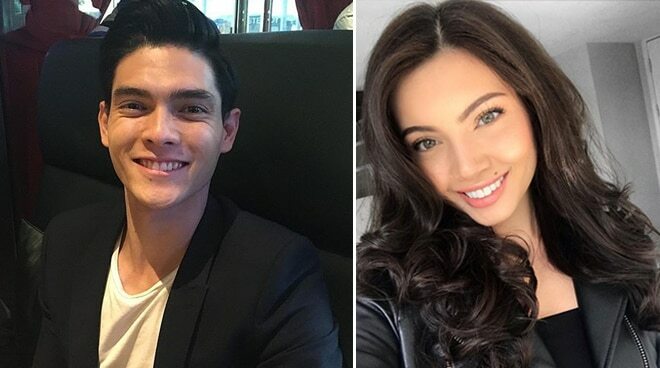 It’s been one year since Ethan Salvador started dating beauty queen Maureen Montagne who is currently in Egypt preparing for the Miss Eco International pageant on March 29. As Maureen prepares to fight for the crown, Ethan said she has his full support. “I have no doubts. It’s her thing. I support her 100% in every pursuit that she does and this is going to be her moment. I’m very confident. If I could define her, I would say she has the skin of a rhino and the heart of a baby. She’s so tough but yet she’s so loving and she has everybody’s best interests at heart,” he told PUSH. Ethan admitted he did not expect to find a girlfriend from showbiz. “I really didn’t expect it. It wasn’t in the plans. It just happened. We’ve been together for a year now. We met through work. At first I was kind of intimidated because she’s the prettiest girl I’ve ever seen ever. Last year at that work event as like, ‘Wow!’ But I didn’t expect much out of it but she approached me and I approached her and I realized she’s really nice. She’s so kind and she made me laugh so hard that night. She just has such a kind heart and she cares about others down to the core,” he admitted. The actor-host said that he and his girlfriend both grew up in the States which helped make them feel closer. “I’m from Las Vegas, Nevada and she’s from Arizona. You could say it’s fate that we met here. I think it’s really interesting because when I first came here, you don’t expect to meet so many different varieties of people from all around the world. And she’s one of the people who came from close by to my home so it’s kind of like a little piece of home when I saw her and things just kind of fell into place and it was beautiful,” he shared. Dating a beauty queen is not an issue for Ethan who said he is not the jealous type of boyfriend. “I admire and respect about this girl is just absolute honesty. And we have so many talks and we have sit-downs and we talk about building a life and building our careers. We’re two separate individuals that support each other. she can go out and do their thing, I can go out and do my thing but the trust is always there and if something ever bothers me, I know I can go to her and talk to her and vice-versa. That’s something that’s really strong about us,” he said. Ethan said he is happy that they have both met each other’s parents during their recent trip abroad. “It’s definitely serious. My mom loves her. I met her mom recently and she met my mom when we went back to the States and it was such a blessing that I’ve never seen my mom so happy with a person that I’ve chosen. I’m an only child and me and my mom are really close. So for her to have like an approval and be like, ‘She’s such a lovely woman. She’s very kind and genuine and I can tell she’s going to take care of my son.’ We’ve been together one year but it feels a lot longer. I’ve got my best friend right here, It goes deeper than that,” he added.